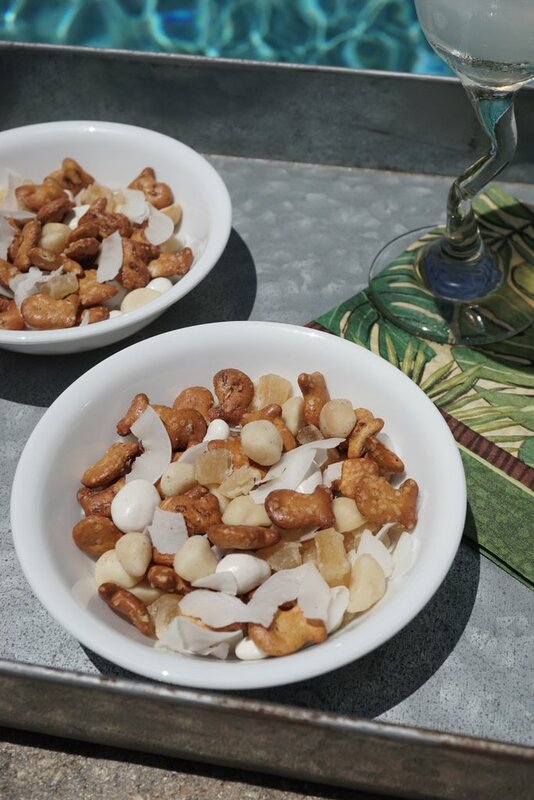 Try this quick and easy snack mix, featuring macadamia nuts, for a taste of the tropics! 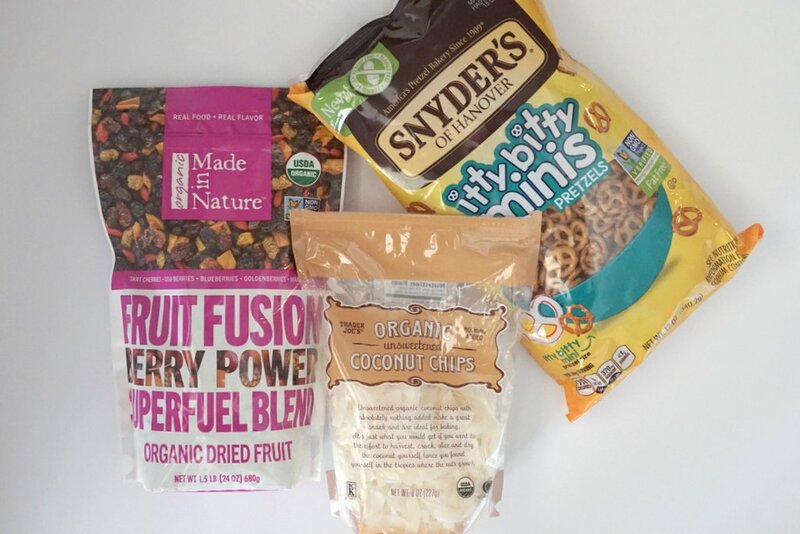 I love putting together quick, easy snack mixes! They are a staple snack for my family. I always have a container of some sort of snack mix in my pantry, homemade or store bought. It’s fun to come up with different combinations and be creative! It’s also a great way to stretch out a more expensive ingredient (like macadamia nuts). 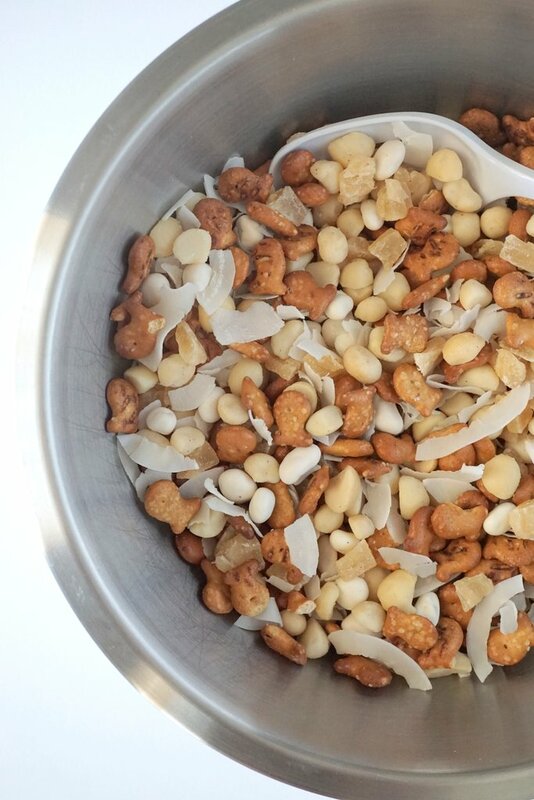 This snack mix is inspired by the tropics with flavors that make me think of palm trees, beaches and balmy weather… enjoy! It was not intentional, but turns out I was all over the place when I gathered these ingredients… Target, Trader Joes, and Publix. However, I’m certain you will be able to find all these items at one store! Although, since Macadamia Nuts do tend to be a bit pricey (but worth it! ), I like to purchase them through Amazon (affiliate link) where I can find a better deal. Dry Roasted Macadamia Nuts with Seal Salt: Yes, higher in fat than most other nuts, but it’s the “good” fat… monounsaturated fat (like in avocados and olive oil). 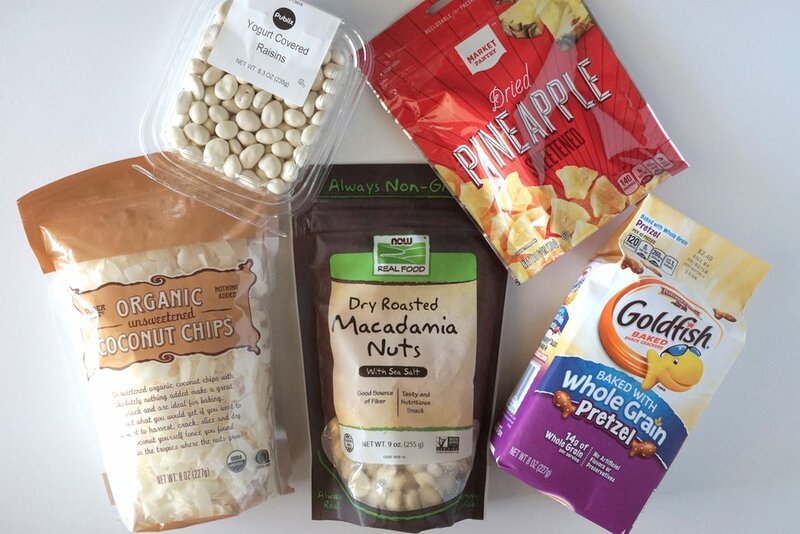 Just like any nut, moderation is key, which is why enjoying them in a snack mix is perfect! Also a great source of fiber, thiamin and manganese. Dried Pineapple, Sweetened: Since there’s added sugar to sweeten the dried fruit, you’ll want to treat this ingredient like candy. I chopped up the large pieces into smaller pieces and therefore yielded over a cup. Dispersed through the mix, it adds just the right amount of tropical sweetness. Yogurt Covered Raisins: A favorite sweet treat by itself… even better in this snack mix! Raisins are a source of potassium, iron and fiber. The yogurt coating adds a very small amount of calcium. Whole Grain Pretzel Goldfish: The fish shape adds to the fun factor and the tropical feel, while the pretzel provides that salty, satisfying crunch. Unsweetened Coconut Chips: Be sure to buy the “unsweetened” coconut because there is already enough sugar from the dried pineapple and raisins. If you can’t find the larger chips, just use the shredded stuff. *Tip: You’ll be using the entire package of each ingredient except for the Unsweetened Coconut Chips (unless you buy a smaller package). Instead of having a bag of coconut chips hanging around in your pantry for the next few weeks, use it up in your next snack mix! 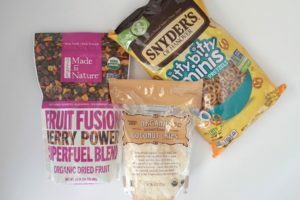 After my Tropical Snack Mix was eaten up, I made a simple mix with the remaining coconut, a mix of dried fruit (from Costco) and a bag of mini pretzels. You could also add some unsalted raw almonds, or any other nut, to the mix as well! One easy step: Add all the ingredients to a large bowl and gently MIX!! I like to then disperse some of the snack mix into small containers so they are ready to grab and eat throughout the week! I store the rest of the mix in an airtight container in my pantry. 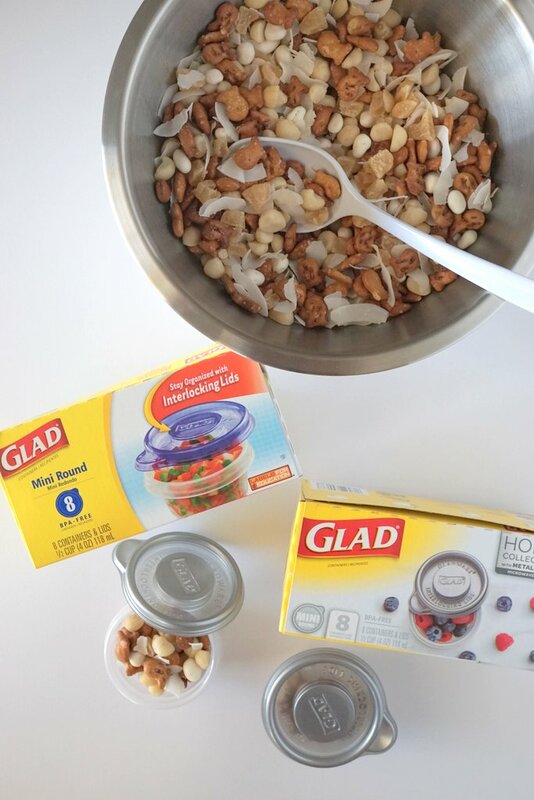 These 1/2 cup mini round containers from Glad are the perfect size! I love the new Metallic collection which comes in silver or gold! (Find them at Target or Walmart.) They’re perfect to take to school, work, or any time you’re out and about! The sweetness from the dried pineapple and yogurt covered raisins, together with the saltiness from the macadamia nuts and pretzels, is sure to satisfy any snack craving! The understated flavor of the unsweetened coconut brings everything together to provide that tropical feel! The fiber will help keep you full! 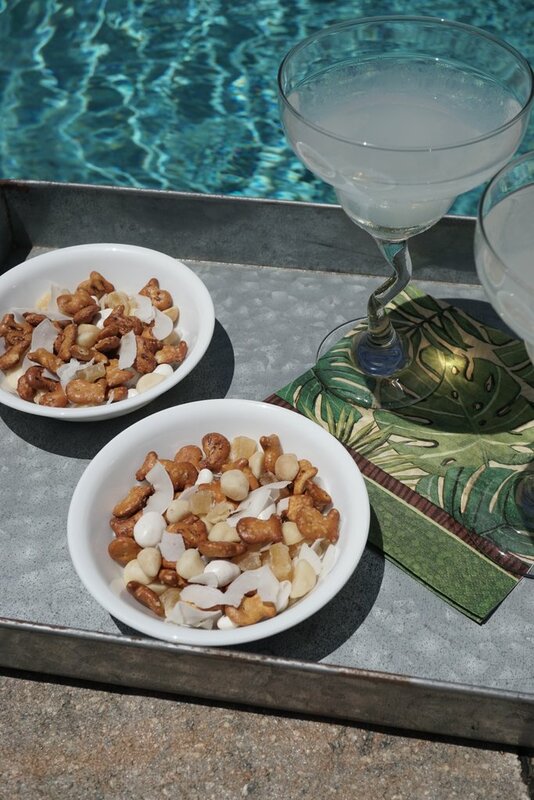 Enjoy this snack poolside or on your next trip to the beach! Add a cold glass of lemonade and relax!! 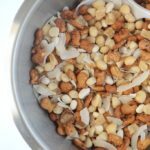 This quick and easy snack mix, featuring macadamia nuts, will take you away to the tropics anytime you desire! Add all ingredients to a large bowl and gently mix. *Adjust amount of each ingredient to your preference. *Feel free to swap Macadamia nuts for Cashews. *Disperse 1/2 cup servings into small containers or baggies for grab and go. *Store snack mix in an airtight container in a cool, dry place.